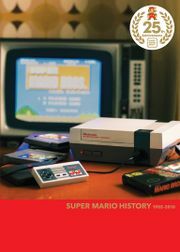 Super Mario History 1985-2010 is a booklet and a soundtrack CD that is bundled with the game Super Mario All-Stars Limited Edition as a tribute to the 25th anniversary of Super Mario Bros.. 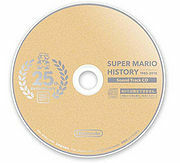 The booklet contains history of Mario's 25 years, unreleased development documents, and the CD contains twenty tracks. Half of the tracks are songs that are from Super Mario Bros., Super Mario Bros. 2, Super Mario Bros. 3, Super Mario World, Super Mario 64, Super Mario Sunshine, New Super Mario Bros., Super Mario Galaxy, New Super Mario Bros. Wii, and Super Mario Galaxy 2 respectively and the other half are sound effects from Super Mario Bros. The Super Mario History booklet is filled with release dates, sketches and artworks from many Mario games. Shigeru Miyamoto, Takashi Tezuka, and Koji Kondo (the fathers of Super Mario) give their opinions of every Mario game. Contents of the book are shown below in order, but without page numbers. The Japanese, European & Australian version of the book are almost identical. They all use the Japanese covers and release dates. European and Australian versions also include the box art and release dates for their respective regions. Original sketches from Super Mario Bros. The American version only shows the American release dates and box art. A different photo is used for the Fathers of Super Mario. 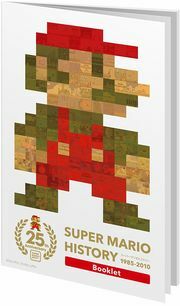 The original Super Mario Bros. 2, known in America as Super Mario Bros.: The Lost Levels, is not included in the list. Super Mario All-Stars is included instead, in this version. The Japanese promotional posters are removed and replaced by promotional toys. Tracks 4 and 6 also include the "riding Yoshi" percussion added to the music. Track 6 also includes the "timer" extra. Super Mario Sunshine and New Super Mario Bros. The overworld song for New Super Mario Bros. on the CD is actually the uncompressed version. This page was last edited on May 27, 2018, at 13:49.